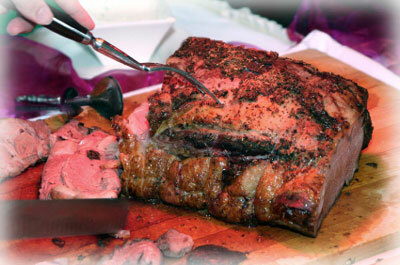 Professional Grilled Prime Rib - perfect everytime. A perfectly grilled Prime Rib roast has to be one of the most spectacular and memorable dinner presentations any host can make. We've all experienced that famous melt-in-your-mouth sensation of rare, tender prime rib at a Steak or Beef-house at one time or another. If you haven't you really should. The best part is, it's so easy to copy those expensive restaurants at home with the simple instructions and recipe that follows. 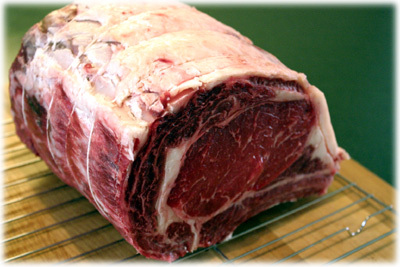 If you're interested in a little background information and tips that will help you make the most of your expensive prime rib roast then please read on. The most important indicator of whether your roast is ready to remove from the grill is its internal temperature, not how long you've cooked it. You'll need to use either a remote temperature probe inserted into the center of the roast or a hand-held temperature probe that you can use to periodically check on the internal temperature. I recommend using the remote temperature probe to avoid opening and closing the grill lid too often. The table below describes the various degrees of "doneness" from rare to well done and the related internal temperature of the meat for each type. 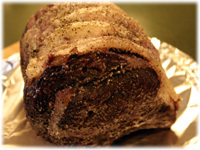 Prime rib is traditionally cooked rare to medium-rare so for example if you wanted a rare roast you'd remove it from the grill when it's internal temperature was 115F. The internal temperature will continue to increase 5 - 10 degrees after it's removed from the heat and after resting for 15 - 30 minutes. (160-up) Remove at 155F This should be illegal. 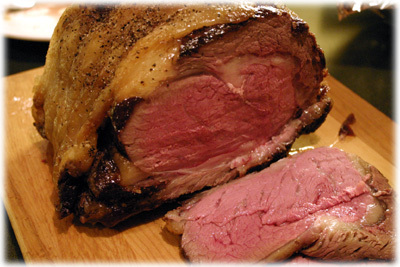 Roasts from the smaller loin end are more tender than from the larger shoulder end. 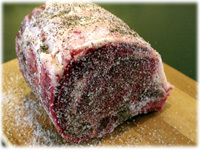 Select a roast with lots of fatty streaks ("marbling") running through the meat for a juicier roast. Trim any external fat so it's no more than 1/2" thick - keep a nice fat cap on the top of the roast - usually 1/4" to 1/3" thick. Allow the roast to come to room temperature covered with plastic wrap before cooking. Don't buy less then a 3 rib roast as it's too hard to cook evenly. Option 1 - either you or the butcher cut the smaller chine (or feather bones) and the larger rib bones from the main roast meat and then tie them back on to the roast with butchers twine to cook with the roast. This is called cradling. I believe this provides only a very minimal benefit when it comes time to carve the roast and may increase some moisture loss. Option 2 - keep all the bones intact on the roast before and during cooking. It's very easy to cut the rib bones off along the bone line prior to carving the roast. I also believe that because they are still naturally attached to the meat they help prevent that section of the roast from drying out. I believe that this helps provide a juicier roast. Whatever option you choose, keep the bones after cooking to either nibble on or use later for soups or stews. 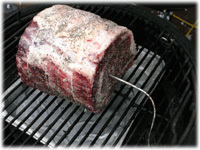 Indirect Heat: 200F until roast reaches 125F internal temperature for medium-rare then 500F for 10 minutes. This prime rib recipe needs a grill setup for indirect heat. Place an aluminum drip pan the size of the roast under the grate. With the roast at room temperature rub melted butter (or oil) all over surface of roast. 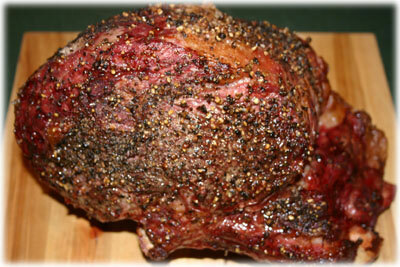 Rub cracked peppercorns, kosher salt and dried thyme over the entire surface of the roast. Insert a remote temperature probe into the center of the roast (recommended) - make sure it isn't touching a bone. Pre-measure how far to insert the probe by laying it on top of the roast and seeing how much to insert to make sure it's in the center. Make sure the roast is at room temperature before placing it on the pre-heated grill. Place the roast directly on the BBQ grates (or in an inverted rib rack) over the drip pan, plug in your remote thermometer and set it for the desired internal temperature. Cook at 200F until the internal temperature reaches 125F for medium-rare or 135F for medium. When the thermometer reaches your set-point temperature remove the roast from the grill and cover with foil for 30 minutes before you want to serve it to allow juices to redistribute within the meat. 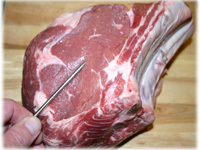 If you're not using a remote probe thermometer then at least 30 minutes before the cooking time is completed open the lid and insert a hand-held thermometer into the meat without touching a bone. Check every 15 minutes this way until desired internal temperature is reached. When done remove the grilled prime rib from the grill, cover with foil and let rest. Heat the grill (or your oven) to 500F - 550F. About 10 minutes before you want to serve the prime rib remove the foil and place the roast back on the grill (or in your oven) and cook at 500F - 550F until the exterior of the roast is well browned and crisp. Remove the cooked roast from the grill (or your oven). Lay the prime rib on it's side and carefully slice the meat between the bones and the main piece of meat along the bone-line to remove the bones. Set aside. Re-orient the meat to it's original bone down position and begin slicing across the grain as you would normal roasts. Make 1/4" to 1/2" slices. Slice only the amount you are serving so the rest doesn't dry out. The bone section that you separated from the main meat section should be saved to nibble on or use for soups or stews.